FELTON, Del. - Say Maryland's Eastern Shore, and crab comes to mind. But what we 10 traveling cyclists discovered was that another four-letter food starting with C is more plentiful in the coastal areas of Maryland and Delaware. Corn, oceans of it, with soybean fields thrown in. ``There's too much corn," declared 7-year-old Olivia Howe, arms outstretched toward the fields as we rolled by. ``Everywhere I look, there's corn." Granted, Olivia, who lives in Brattleboro, didn't always have the best view. Much of the week she faced the back of her mother, Alice Charkes, 44, who captained the tandem bicycle they rode. And, as we told her, the best was yet to come. Charkes and I had mapped out the six-day journey so as to tour the countryside first and the oceanfront last. ``It will be better for the kids," I had told Charkes. ``That way they'll have something to look forward to." In fact, after a couple days of riding past farm after farm, we six adults were as ecstatic on reaching the beach as were the four youngsters. It was hard to believe that deeply rural areas were so close to a series of populated beaches, from Rehoboth Beach down to Assateague Island in Maryland. This was the sixth kid-friendly bicycle tour Charkes has organized for friends, starting when Olivia was 18 months old. She also leads rides for Adventure Cycling Association. All her trips are self-contained, meaning no vehicles are involved. We carried all our gear, camped, and usually cooked. My husband and I were the only ones on single bicycles. Barb Walsh, 47, of East Dover, Vt., captained a tandem ably stoked by her son Ren Chock, 10. She and her husband own Brattleboro Bicycle Shop, and her mechanical skills came in quite handy. Then there were our showstoppers, the Skerrett family from Fairfax, Vt.: Will, 41; Jennifer, 38; and their daughters, Elizabeth, 9, and Anna, 6. 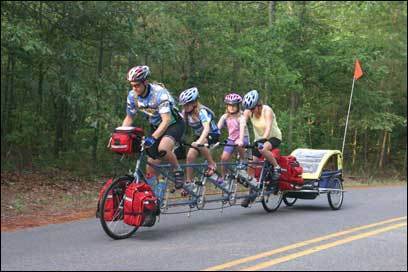 They rode a bicycle built for four and pulled gear behind them in a Burley trailer. (The ``quad" was custom-made by Santana Cycles in Southern California and purchased through Belmont Wheelworks in Belmont, Mass., the closest shop that could handle the order.) This was the family's first self-contained tour. They are planning a cross-country adventure for summer 2009. Dad rode in front, Mom in the back, and the girls in the middle, their feet resting on pedals a foot higher than their parents'. To start, their feet would move into formation when Will Skerrett would call ``Pedal up! . . . ``One, two, three . . . go!" he would shout, and they would slowly move forward. Charkes's previous family rides have been in New England and Canada, but when she came across a mention of the Great Delmarva Bicycling Trail, her interest was piqued. Delmarva is the peninsula occupied by Delaware, Maryland, and Virginia; we didn't make it to Virginia. The region is flat, has miles of coastline, and is within reach of a host of state parks, making it handy for auto travelers, too. We enlisted the help of Delmarva Low Impact Tourism Experiences, whose office marked the route using low-trafficked auto roads. (The cycling map should be used in conjunction with a more detailed one, such as DeLorme's Maryland/Delaware Atlas &#amp Gazetteer.) Jim Rapp, executive director, happy to assist any Delmarva visitor, looked over our route and pointed out places of interest. He also stepped in to save the day when we were told that we couldn't leave our cars for the week at our designated parking spot. Charkes sketched out five days of 30- to 42-mile days, with one rest day. I recalculated, and added a few miles here and there. Our average daily distance was 47 miles, for a total of 235 miles. So how do the kids do it? Although they're pedaling, they're not necessarily using force, Charkes said. ``Imagine you're riding with Lance Armstrong," she said. ``Your legs would go around, but he'd be doing all the work." Ren, however, was old enough to help. ``I could definitely feel him doing a lot of work," his mother said proudly. Then there's the entertainment factor. ``Long bike rides are boring for kids; there's not much you can do to change that," Will Skerrett said. ``But the friendships, the beach, and the sites were the saving grace." Of course there were meltdowns along the way, not to mention melt-worthy temperatures, but it was apparent that these children, like their parents, enjoy playing outdoors. Our first day out, leaving from Killens Pond State Park, was all rural. We passed fields of corn, soybeans, and melons, and held our noses when the smell of chicken coops and manure filled the air. As several old schoolbuses without windows and some without roofs chugged by, we saw they were full of just-picked watermelons. Our campground was at Trap Pond State Park, a beautiful, peaceful place and home to great blue herons, egrets, and the northernmost stand of baldcypress trees in the country. The kids ran around for hours, and Olivia and Elizabeth, strangers before the trip, became fast friends. Along with produce farms, we passed several horse farms, much to budding equestrian Olivia's delight. During a stop at a convenience store, a woman started chatting with Charkes and Olivia. She was Sandy Winter, a 1972 graduate from Malden High School who runs 4STEPS Therapeutic Riding Program from her home in Parsonsburg, Md., just down the road. She invited Olivia to stop by and pet the horses, and 20 minutes later Olivia was off her bike and on top of Zephyr, beaming, while they took a few turns. We reconvened at Furnace Town Living Heritage Museum, where we toured the 19th-century iron furnace and re-created industrial village. Olivia and Elizabeth honed in on the gift shop's prairie bonnets, which they purchased and lived in the rest of the week. Ren was stuck with grocery duties with his mother and me, but the rest of the kids hightailed it to the campground pool at Pocomoke River State Forest and Park. Cycling out the next day through the tiny historic riverfront town of Snow Hill, Md., we discovered we'd missed the annual Blessing of the Combines by a few days. We stopped for lunch at the larger historic town of Berlin, Md., once a popular stop for Colonial travelers. The 37-mile-long Assateague Island, an hour away by bike, was our pot of gold, and we were not disappointed. ``If we had come here first, no one would have wanted to leave," Will Skerrett said as he surveyed our sandy campsite a dune away from the Atlantic Ocean. The island's 140 or so wild horses, or ``Assateague ponies," while quite beautiful, are also quite the pests. They make daily rounds of the campsites, seeing what's on the menu, while tourists photograph their every move. Half the group spent our free day at the beach, while some of us headed to the adjacent national seashore. Finally we saw crabs - being examined by park rangers and being caught by visitors. My husband and I rented a canoe, while Ren and Walsh did a little clam digging. Ren used a camp stove to steam his lone find. His review? ``It was chewy." We had a big treat on this night. Will Skerrett's parents, who, coincidentally, live in nearby Georgetown, Del., delivered pizza, perfect crab cakes, and ice-cold drinks. Life was good, even if it had topped 100 degrees that day and the kids couldn't stop playing in the sand after their showers. We passed several enticing beach towns before reaching our final campground: lively Ocean City, Md., small-town Bethany Beach, and old-fashioned Rehoboth. Our campground at Cape Henlopen State Park, known for its World War II lookout towers, was only a 10-minute walk from the ocean. The scenery reversed on our final day of riding, in Delaware. We zipped by more lovely historic towns - Lewes, Milton, and Milford. And having left the ocean, it was back to that other sea - of corn. Diane Daniel, a freelance writer based in North Carolina, can be reached at diane@bydianedaniel.com. 9609 Stephen Decatur Highway Berlin, Md. Contact DLITE for travel information and to order ``Great Delmarva Bicycling Trail" map ($5). 150 East Pine St. Missoula, Mont. Tours, equipment, and resources for bicycling touring. Popular Delmarva bicycle rides (62- and 100-mile options offered), sponsored by Salisbury University. 5025 Killens Pond Road Felton, Del. Boat and fish at a millpond, play at a water park ($2). 33587 Baldcypress Lane Laurel, Del. View wildlife from rental canoes and paddle boats. Riverfront park features a large swimming pool. All campgrounds beachside at Maryland's only ocean park.